Arsenal defeated West Bromwich Albon 2-0 at the Emirates Stadium as their record signing Alexandre Lacazette scored a goal in each half of the game to give Gunners a hard-fought win over Tony Pulis' men. The win takes Arsenal to the seventh position in the Premier League table behind Watford FC. The Gunners didn’t have the best of starts to the game with Arsene Wenger pushing Aaron Ramsey up to the flanks this time following his brilliant display from the midfield against Chelsea while Mesut Ozil started on the bench. It took Arsenal 20 minutes to open the scoring when a clinical Lacazette latched on to an opportunity from Alexis Sanchez’s free-kick, which was tipped into the crossbar by West Bromwich Albion goalie Ben Foster. It was an open net and the striker headed it past a helpless keeper to make the score 1-0. West Brom had a series of counter attacks and they came extremely close through Jay Rodriguez early in the game when Arsenal centre-half Shkodran Mustafi brought him down with a sliding challenge- but no foul was given by referee Bobby Madley. The English striker didn’t stay on the ground and took a curling shot that was tipped to the far post by a diving Petr Cech. Arsenal were more assuring in the second-half and soon reaped the fruit of their tenacity as Allan Nyom barged over Aaron Ramsey close to the byeline conceding a penalty in the 67 minute. The £46.5m summer signing from Lyon stepped up to slot it into the bottom right corner and take his tally to four goals this season. Alexandre Lacazette now becomes the first Arsenal player to score in his opening three league appearances at home in the last 29 years. The last player to achieve it was Brian Marwood in September 1988. 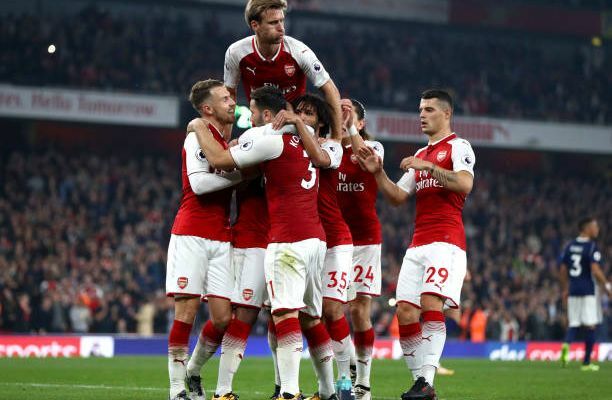 The Gunners now sit at the seventh position in the league table as they trail by a point behind archrivals Tottenham Hotspur (4) and six points behind league leaders Manchester City, as West Brom drop to 12th.